Private airports are a popular way to travel to/from Denver, and we use the following airports to fly clients privately in Denver, Colorado and neighboring areas of the Centennial State. Centennial is the preferred arrival/departure choice for business jets and private flyers, featuring 24 hour service, 5 fixed-based operators, and customs services on-site. Flights can also be arranged to Denver International, as well as connecting flights from commercial airliners. If you’re looking to arrive as close to downtown as you can, check out Rocky Mountain Metropolitan. Centennial Airport (IATA: APA, ICAO: KAPA, FAA LID: APA) is Denver’s most popular private jet hub, and one of the top general aviation hubs in the United States. Centennial is an international airport offering round-the-clock customs services in one of the country’s most popular aviation destinations, averaging between 850-900 operations per day with more than 850 aircraft based on-site. 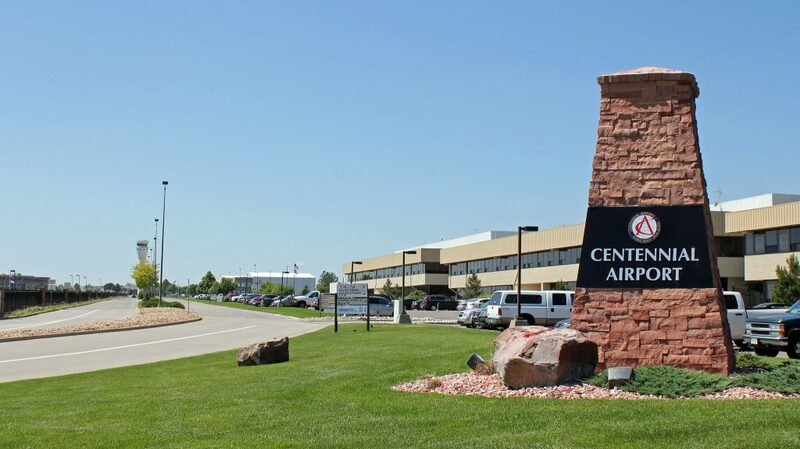 (APA) Centennial is located relatively close to downtown at 18 miles away in the suburb of Englewood; driving time usually equates to around 45-60 minutes, making (BJC) Rocky Mountain Metropolitan a more attractive choice for business jets and executives flying private to the area. Centennial’s facilities include 3 asphalt runways to facilitate private flights, with runway 17L/35R measuring 10,001 feet to accommodate long-range corporate jets, VIP airliners, even heavy jets loaded up with your family’s ski equipment. There’s also 4 private jet FBOs (TacAir, Denver jetCenter, Signature Flight Support, XJet) and a helicopter FBO (The Heliplex) offering their services to private flyers at Centennial APA; please inform your broker if you have a preferred FBO and we will arrange for you to arrive/depart from your specified FBO. Book a private jet and fly to Denver International Airport (IATA: DEN, ICAO: KDEN, FAA LID: DEN), the largest airport (total land area) in the United States, and 6th busiest in the nation in terms of passenger traffic. It’s often referred to by its initials “DIA” instead of its location identifier, and its home to several unique features. The terminal features a peaked roof designed to resemble snow-capped mountains and early history of Colorado when Native American teepees were scattered across the Great Plains. 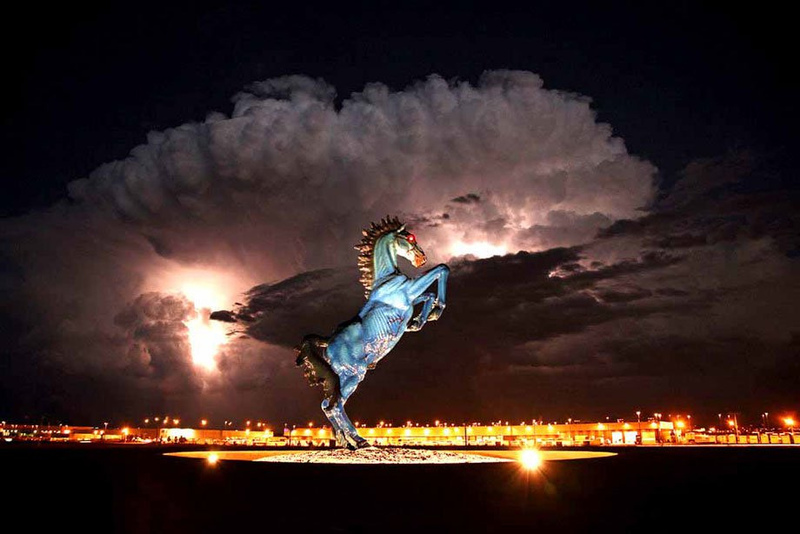 KDEN is also home to a 32-foot tall sculpture of a blue mustang with glowing red eyes, known to the locals by the name Blucifer. (KDEN) Denver International is home to six runways in total, five of which measure 12,000 feet long, and a single 16,000 foot runway, the longest public use runway in the country. Although it’s a public commercial hub, there are FBO services offered by Signature Flight Support to provide luxurious private aviation experience. KDEN has been the recipient of numerous awards over the years, voted Best Airport in North America by readers of Business Traveler Magazine six years in a row (2005–2010) and named “America’s Best Run Airport” by Time Magazine in 2002. If you’re heading to the city or planning a ski trip to Vail or Breckenridge, allow us to arrange your private flight into (KDEN, DEN) Denver International. Formerly known as Jefferson County or Jeffco, Rocky Mountain Metropolitan Airport (IATA: BJC, ICAO: KBJC, FAA LID: BJC) is a public airport in Broomfield, Colorado. It’s a popular choice for business jet flights thanks to its location about 16 miles from Denver’s central business district, and being the closest facility to downtown. 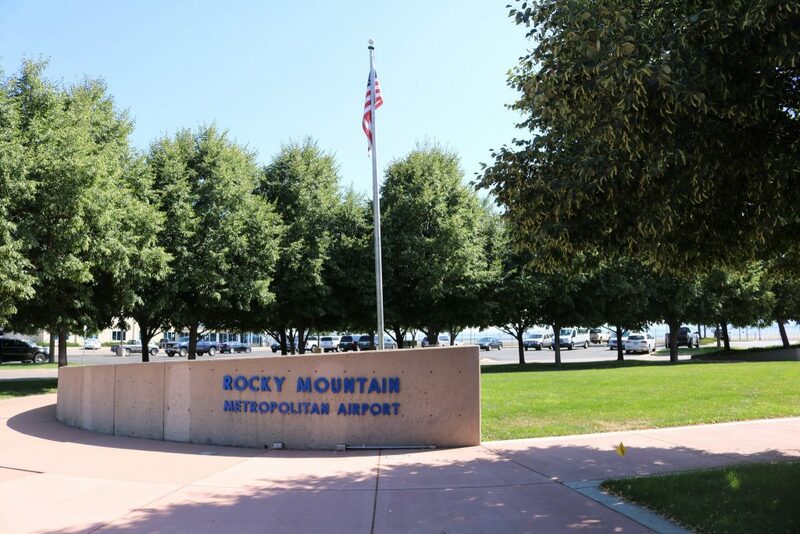 Rocky Mountain Metropolitan Airport (BJC) features 3 asphalt runways measuring 3,600, 7,002 and 9,000 feet to allow turbo-props, light/mid/heavy jets and airliners to arrive and depart; Signature Flight Support BJC operates the on-site FBO. It’s categorized as a reliever facility by the FAA, and is a popular hub for general and private aviation in Colorado. More than 350 aircraft are based at Rocky Mountain Metropolitan, and it averages around 350 operations per day. There are also a number of flight schools located on-site, along with a pilot’s lounge inside the FBO, and two restaurants, E’s Just Good Eats and Blue Sky Bistro. There’s even a bed & breakfast, The Hilltop Inn, along with its companion restaurant. Have any questions regarding Denver’s private jet airports for your upcoming flight? Call us at 1-888-987-5387 to speak with one of our brokers to discuss the options for your flight to Colorado.